The Experiential Technologies Lab at the College of Arts Media and Design is a state of the art resource for AR/VR, biometrics and user testing research and teaching. For questions about the lab, to schedule a visit or to sign up to use the equipment, please email Jason Duhaime, New Technology Manager at j.duhaime@northeastern.edu. 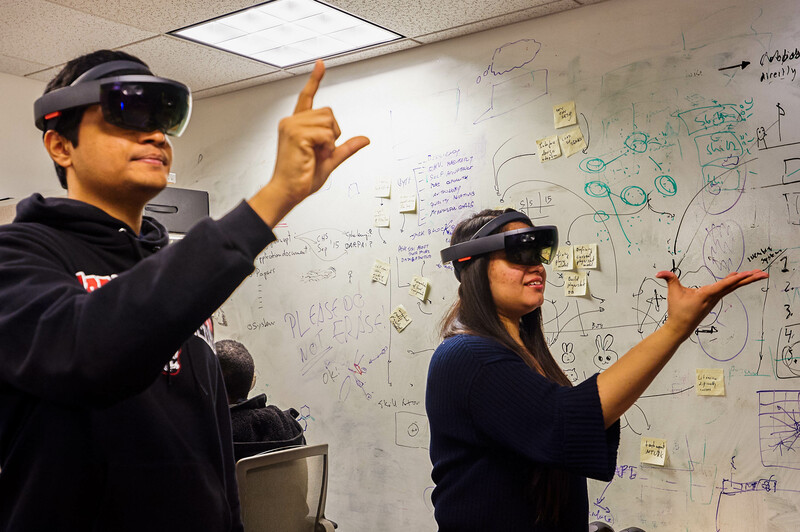 Current faculty and student work using AR and VR technologies includes creating prototypes and rapid iterations for games and entertainment, cognition and health care delivery research, and engaging the nature of immersive human experience. Digital storytelling, media advocacy, new forms of visualization and communication using AR/VR engage, explore, analyze and inform on crucial topics such as climate change, urban resiliency, political events and social justice. Students and faculty are working together on projects using modalities such as eye tracking and biometric tools for capturing user data including electrodermal activity, heart rate, EEG, and facial expression analysis. We are exploring the limits of biometrics as sources of information for evaluating products in rapid iterative design processes, and integrating various forms of biofeedback into game development, aging and health research, scenario building and security-related work. The lab’s usability environment and tools provide excellent resources for evaluation, testing and tuning of software, design and user experience, as well as the formation and application of new methods for practice-based theories of socio-technical systems. Faculty and students collaborate on the creation of games, health and lifestyle platforms, interactive media and narrative projects using high end software, cameras, eye tracking and one-way mirror, interviews, and observation coding. The Tilt Brush suite enables painting, drawing and sculpting in the three-dimensional environment of virtual reality. Exciting new modes of creativity and content creation are offered, allowing the artist/designer/performer/researcher to use their body to shape and experience their work from the perspective of the audience. Used for cutting edge forms of humanics teaching and research, we are driving wholly new experiences at the intersection of human perception and technology. Access to the Adobe Creative suite for post-production video editing of the 360 video.